On the right side of the plot is the line schedule with dimensions from the plaster line. An inventory of our lighting fixtures and console type is also listed on the plot. Most of the theater lights are conventional but we do have some moving lights in the rig and some LED wireless fixtures. We also have an extensive inventory of moving lights, strobes, blinders, ACLs and LED wired and battery/wireless fixtures available. Please check with the Technical Director as these fixtures may have extra costs associated with them. All dimmable conventional fixtures use 20 amp stage pin connectors while many of the non-conventional lights use Edison connectors. Side lighting is pipe and base. There are no ladders or tail-downs. We can also email an Excel sheet of the line schedule showing positions of electrics, curtains, and other hung goods. Load weights are included. Most battens are 6” on center and it is a single purchase fly system. A variety of accessories are available including barn doors, donuts, snoots, pattern holders, and alternative PAR64 lamps (NSP, MFL or WFL). We have an assortment of color gels in stock. The lighting system control is an ETC Ion Console with 60 faders and dual touchscreens. Remote focus units are available (IRFR and through a dedicated mobile device). A grandMA 2 light console may also be available unless it is in use in another venue. The dimmers are Strand CD-80’s and there are (323) 2.4K dimmers and (10) 6K dimmers, totaling 333 usable circuits. There are two Strong xenon Super Trouper 1.6K short throw follow spots, permanently housed in an enclosed booth above the top balcony. Distance to the plaster line is approximately 100’. The follow spots are spaced approximately 16’ apart from each other. Our current FOH console is a Yamaha CL5 digital mixing console, Built-in Meter Bridge, and 72 input channels. This system is Networked with 2 x RIO Racks 32x24 that handles Inputs & Outputs from Stage. Outputs at FOH are sent to a Meyer Sound Galileo Callisto 616 Processor and distributed to 20 Meyer Sound MICA speakers flown 10 per side. Ground Fills are TWO Meyer CQ-1 speakers on top of TWO 700-HP subwoofers per side. 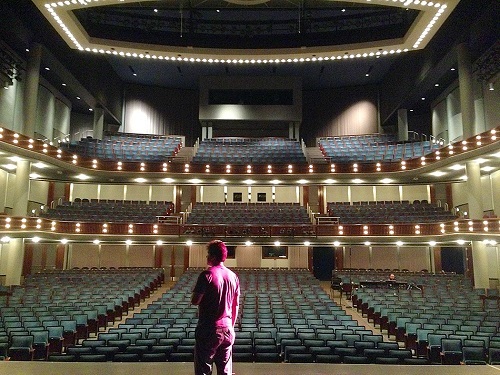 FOUR Meyer Sound M1D speakers are used for front fills on the lip of the stage. Compass software to control and equalize all components is available for visiting engineers. A second Yamaha CL5 72 channel mixing console is available for Stage Monitor mixing that is part of the RIO Racks system in the shared input gains through Yamaha Gain Compensation features. TWELVE JBL VTX M22 Dual 12” Monitor Cabinets with amplification and processing through Crown 4x3500HD for a total of TWELVE Bi-amp mixes. Side Fills and Drum Fills are JBL VRX 932 Components with amplification and processing from Crown/Harmon. 48 Channel Transformer 3-way copper splitter is available upon request. We have a viable range of professional microphones, stands and Direct Boxes to accommodate most touring acts, as well as associated Whirlwind stage patch systems, sub-snakes and microphone cabling to assemble and pin the stage in a professional manner. Alternative Monitors & Consoles should be discussed with the MACC Technical Director. SIX Shure Combo Channels of wireless systems UR4S. SIX UR2 Handhelds w/assorted KSM9, SM-58 or Beta87 capsules and SIX UR Belt packs. Active Antenna system with WB antennas. Clear-Com FREE-SPEAK II WIRELESS Intercom with FOUR Belt Packs and a Clear-Com Base Station which works in conjunction with many WIRED Clear-Com Headsets & Belt Packs located in several positions throughout the Castle Theater. 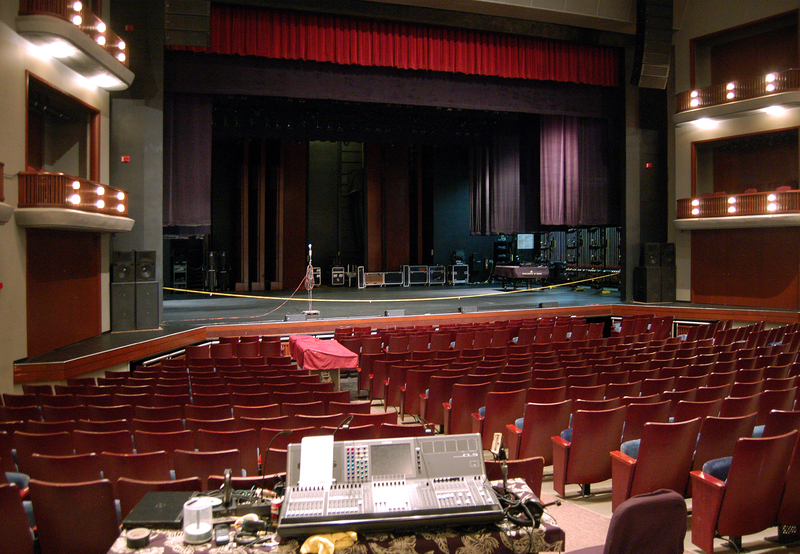 TWO Cam-Lok disconnect panels located on the wall upstage right. Each panel is 3-phase 400A. ONE Cam-Lok disconnect panel 3-phase 100A located upstage left. ONE Cam-Lok disconnect panel 3-phase 30A located upstage center up high in the grid above the stage. All lines are controlled from the locking rail on stage left. The loading bridge is located approximately 71' above stage level and has approximately 50,000 lbs. of available weights. Additionally, weights can be loaded from a fly gallery at the pin rail located 37' above stage level. Our acoustically reflective, African mahogany wood orchestra shell consists of seven 30' tall rolling towers and three ceiling pieces (clouds). With multiple configurations available, the largest is designed to accommodate up to 100 musicians. When stored, the tower units live in an upstage cove, and the clouds are permanently hung on line sets 14, 32, & 47 and cannot be moved. The two downstage clouds are on motorized line sets while the third, upstage cloud is manually operated. The two downstage clouds have built-in lighting and with the addition of front of house lighting positions, provide a full-stage dimmable wash. 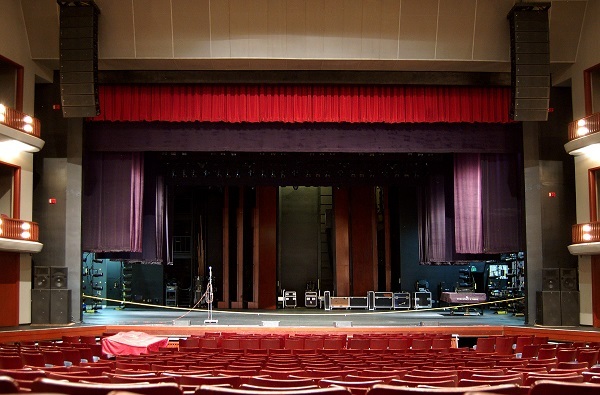 NOTE: The main curtain cannot travel when the orchestra shell is in place. There is an adjustable orchestra pit powered by a Gagnon LaForest tubular thrust screw lift system. The Pit can be set from stage level to 13' below stage level. The Pit is 56' wide at its widest point and 12' deep on center. 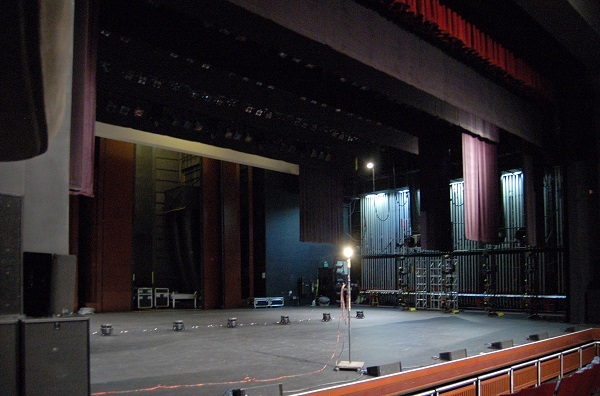 Four rows of 72 seats are removed when the pit is used as an extension to the stage or lowered to accommodate an orchestra or to be used as a dance floor. The "default" configuration of the pit is at audience level with seats installed. There is a charge for the removal and replacement of the pit seats and decisions to do so must be made before tickets go on sale. Pit surface is the same as the stage floor. Pit controls are located either down stage right or on the pit. Trap doors on the pit surface provide access to microphone, line, communications, and AC power. We have 65 black, padded, Wenger musician chairs plus 5 padded cello chairs. We have approximately 40 black Manhasset music stands. We have limited backline which includes guitar and bass amplifiers. We have a 9’ Steinway concert grand piano, D Model with ebony finish. We work with local vendors for other backline equipment. Contact our technical director for more information. 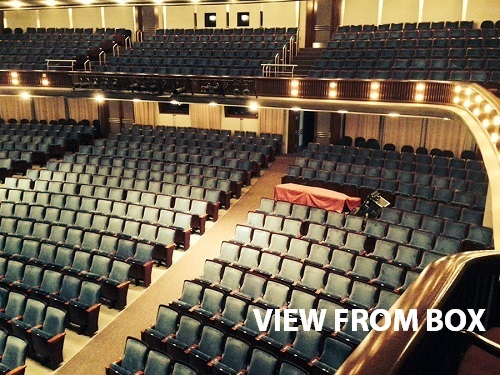 Our projection booth is located at the back of the house on the mezzanine level (86’ distance from movie screen). Our main projector is a Christie Roadster HD12K 3-chip 1080 DLP projector. 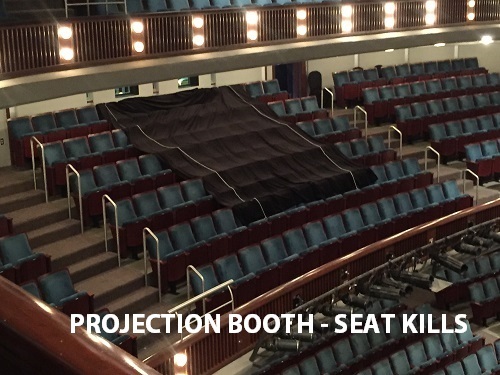 Seats in the center section of the mezzanine are within the projection path and must be killed when projecting from the booth. We also have TWO Eiki LC-HDT700 projectors. While they are lower in lumens, they are newer projectors with improved optics that rival the Christie 12K. Additionally, they could conceivably be stacked and run as dual-projectors with combined lumen output capacity. Our 48’ wide x 22’ high PVC perforated projection screen hangs downstage on line set 6 and nearly fills the proscenium. A border and adjustable side masking can reduce the size to fit the video format. We also have 2 projection screens at 10.5’H x 18.5’W which can hang from a batten or stand on legs. These screens are dual-view and can be projected onto from the front or from behind. The Center has a Folsum Presentation Pro switcher (VGA out only), laptops, DVD and BluRay players.